Advanced 2018 Version of SK-BTI-030, Amazing Golvery Mini Bluetooth V4.1 Receiver Hands-Free Car kit Music Adapter. Pairs and Works with any iPhone, iPod, iPad, iOS, Android Smartphones,Tablets via Bluetooth and then easily plugs into any powered Car & Home Stereo Sound System and Speakers with 3.5mm/ 2.5mm RCA AUX port via the audio cable Plug. Designed for echo cancellation and background noise filtration. Noise reduction technology for continuously crystal clear and the improved microphone capturing more of your voice. Hands free calling is more clearer. Thanks to the convenient dual to connections function, you can play music from either of the two devices that are actively connected. 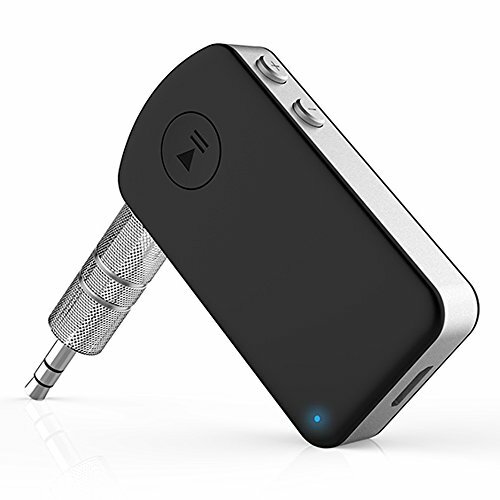 If you want to one Bluetooth Audio Transmitter for TV, Please search Golvery Bluetooth Transmitter. Advanced Bluetooth Receiver/Car kits: Golvery Bluetooth Car Adapter is not only for car, it is also ideal for your home stereo system, wired headphones/speakers. But please do not attempt to connect the gadget to such as Bluetooth headphones or Bluetooth speakers, since the gadget functions as a Bluetooth receiver for those devices without Bluetooth feature itself but desire to receive Bluetooth signal. Eligible for Long-Time Use: 12 hours of talk and play time or up to 300 hours on standby. And you can use it even while charging. Enhanced Calling Experience: Enjoy improved call quality thanks to a microphone calibrated for crystal clear and hands free calling; Better Connectivity: Equipped with the reliable Bluetooth 4.1 for faster and more stable connectivity, this Bluetooth car adapter supports A2DP, AVRCP, HSP, and HFP, available up to 33 feet / 10 meters. Double Link/Re-connect Automatically: Connect two Bluetooth Smart devices at once; freedom to enjoy music or answer phone calls; Just turn on the Bluetooth of your cell phone first, then turn on the Bluetooth receiver, the Golvery Bluetooth Receiver can be automatically paired. If you have any questions about this product by Golvery, contact us by completing and submitting the form below. If you are looking for a specif part number, please include it with your message.